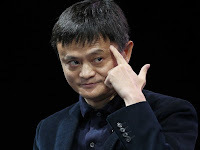 Jack Ma says, "Please tell your children that the world is changing every day and no one is going to wait for you in the past. When lighter was invented, matches slowly disappeared. When calculator was created, abacus was to fade away. When digital camera was designed, the market of negative film no longer existed. When direct market selling/internet-based selling arises, traditional marketing declines. When smartphone with 4G (wireless internet access) was introduced to the world, you no longer need to turn on your computer at home. When WeChat and WhatsApp (mobile text/voice/video messaging) are developed, traditional text messaging is no longer as popular as before. Someone asks Jack Ma, "What is your secret for sucess?" He says, "Really simple...I am doing (action) while you're only watching." Please remember that the world keeps changing every day. If you don't change, you'll be left behind.